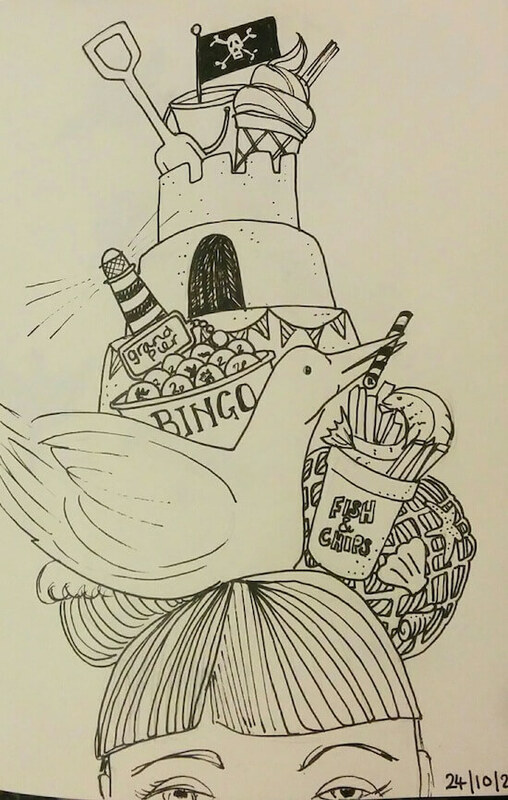 One ink drawing by Laura Morgans, one piece of writing by Tom Spooner, every day in October – part four. 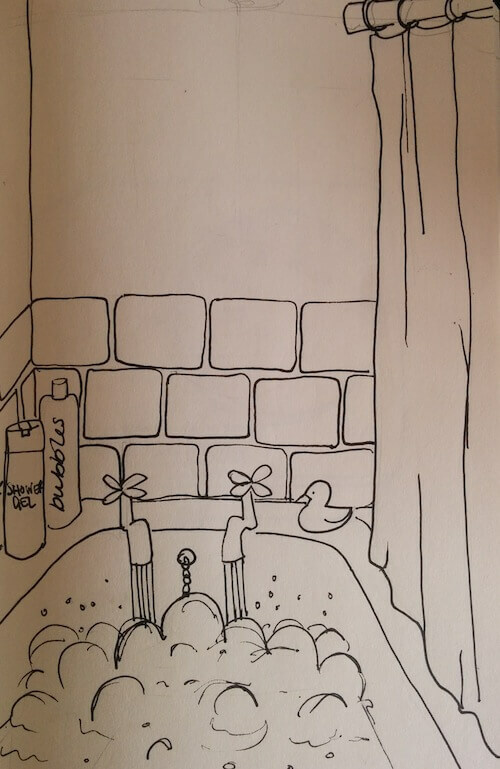 You can imagine yourself anywhere in a bath. It doesn’t matter what is outside of the water, outside the bathroom door, outside your home because as soon as your body is submerged, it all melts away into oblivion. You are floating in a lake on the moon, being lifted by strong arms in the Caribbean sea, held up by your mother to feel the warmth of the sun on your new born cheeks. You are anywhere, everywhere or nowhere – it is up to you. I need you again Leonard. 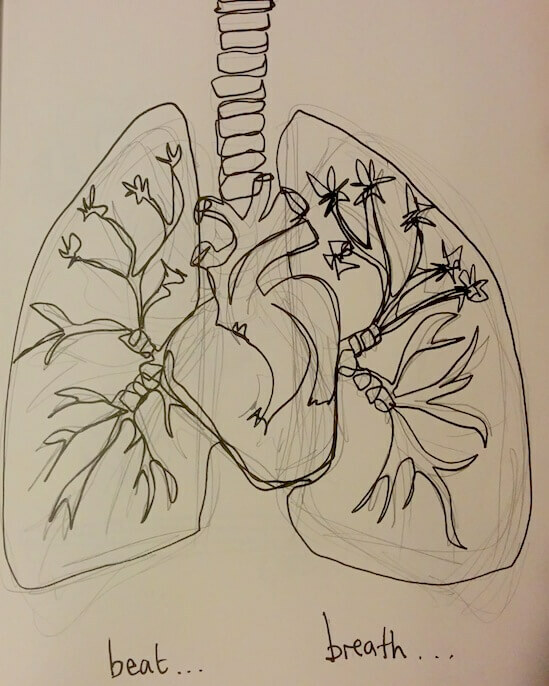 My lungs aren’t taking air and the walls are closing in. The weight of the sky is crushing me and everything is lost. I don’t know if I need to scream or to send my fists through windowpanes. You’ve always been there Leonard when the candles burn to stumps. It’s getting darker again, just like you said it would. When I lost myself, you made me remember. You always saw me, no matter how little light there was. You called to me. You’re still calling now. I need your wisdom and your truth, your poetry and songs. I need you to hold me close till morning, till the new hope dawns. The world is a mess and so am I. Come now and show me the ends of the threads, so I know it’s a knot that comes undone. The silence is as solid and unyielding as concrete. She said that she would call back in a couple of hours. Couple, meaning two. That was seven hours ago now. You replay the woman’s words in your head, the same sentences repeating over and over. The silence breaks. 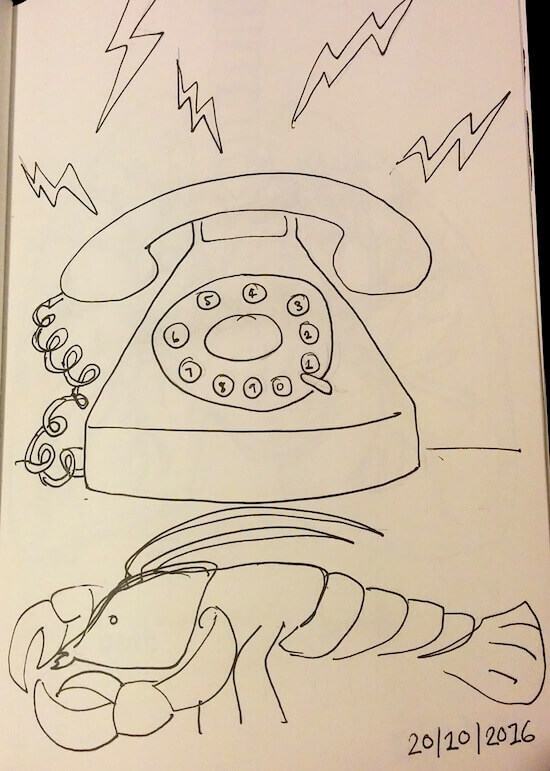 It is not the ringing of the telephone that disturbs it, but a slow clicking sound emanating from the blue-purple crustacean that rests on the coffee table in front of you. You look down at it and see his antennae swishing back and forth. It really is an odd-looking creature: an armoured bug waddling in its makeshift cage of Penguin Classics and chickpea tins. Believe it or not, you actually had plans for the day. It was a drying day for starters – sun out and a keen north-easterly breeze. You were going to hang out the washing, meet a friend for coffee, fix the latch on your mum’s bathroom door, maybe sneak a pint in the Lamplight on the way home before settling down to a Woody Allen film and a scotch. The last thing you had expected was to find a lobster on the lawn, like an alien fallen from out of space, looking pleadingly up at you. The phone still isn’t ringing and it is dark outside. The lobster raises a claw and it looks for a moment like he is offering you up a handshake. The silence grows louder. The two of them sit at the bar and drink, slowly surveying their surroundings through the bottom of a pint glass, laughing at what they see. They’ve lived enough, swam against the current for enough time to have the privilege of not caring. 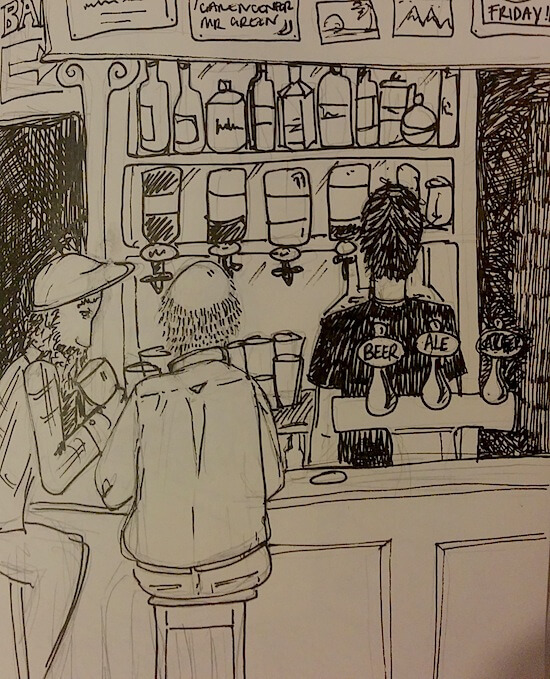 On a stool with their pints and toothless grins, they are happy and weightless. The barman knows what they want and when; when they’ve had enough and when they’ve had too many. It is the only kind of relationship they need and the only one they appreciate. Other people come and go, moving around them like tropical fish. All colours, fins and frills, gliding up and down, gawping whenever they catch a glimpse of themselves. These idiots are trapped by glass that they can’t even see. It is no life, they say to each other, no life at all. Max Levy’s head is a sunflower: a bright yellow beaming sunflower. It is perfect, suiting his high-pitched voice, the way he bounces excitedly on the spot, even how he shreds his guitar. 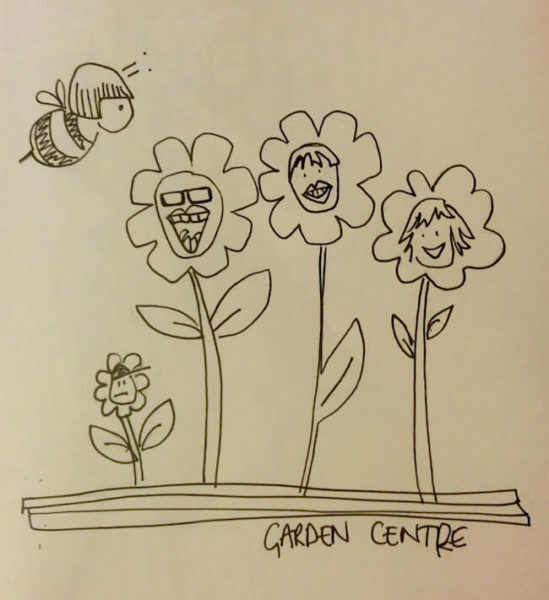 His band – Garden Centre – are also sunflowers except for the woman on keys – she is a bee. The music is suitably summery too, all big pop hooks, bold colours and excitable chirrups. In fact, this latest vehicle for Levy’s leftfield pop is a much needed blast of warm air on a cold autumn night. The emotional exorcisms and trepanned stream of consciousness of previous project King of Cats are not gone completely but have been superseded by Garden Centre. With the help of members of Joanna Gruesome and Keel Her, Levy has channelled his creativity into leaner, more direct songs. His wry lyrics still impress but this time the surreal juxtapositions and moments of heart-tugging tenderness are buoyed by a tight indie-rock sound. The bittersweet Junk Beach, the low-slung slacker bounce of Scrap Yard and the sludgy Elderly Men sound great tonight. It is the effervescent Riding however that is the most triumphant – two minutes of up-tempo danceable pop of the highest order. It’s impossible to review Garden Centre without mentioning Levy’s idiosyncratic voice. It is a powerful instrument – its shrillness cuts through bar chatter, demanding to be heard. It may be divisive, but it is undeniably arresting. It encapsulates what music is all about: finding your voice, however different it may be, and using it to tell your story and to paint the world you see so that others can see it too. Levy’s world is amongst the brightest and most unique and it is a pleasure to catch a glimpse of it tonight. It was a strange compulsion, but one that she could not deny. There was something about the intricateness of the bone-white spider’s web that made her want to break it, destroying completely that little piece of beauty. The hole over which the web had been weaved was the size of a one pence piece. She could have prodded at it with a stick, pursed her lips and blown hard into it, forcing the web to lose its grip on the ancient stone, but no, something in her demanded that she push her index finger through it. The hole was deeper than she imagined and her finger glided all the way in, right up to her knuckle. She thought that she could feel a slight constriction at the end of her finger where the web now clung. It felt satisfying. The web had given away with only the slightest tacky resistance but seemed altogether more powerful now. She attempted to remove her finger from the hole but it did not come. There was a definite pressure on her finger, like a pinch. She yanked at her hand but again it did not come. Her finger was stuck. Her body flushed with panic and she tried again with more force to remove her finger from the hole. The finger did not move this time. The stone had closed around it and was pressing down painfully at the joints. She tried to scream for help but her mouth was completely dry. As her body coursed with adrenalin, she manoeuvred so that her feet were flat against the lichen-covered stone. Slowly she walked up the side of it with tiny shuffling steps. Then, straightening her legs, she pulled with all her strength. The stone tightened its grip on her finger and she felt the bone fracture under the pressure. Despite the dryness, a scream escaped from her mouth. The white pain burned behind her eyes and she felt the acid of vomit sting her throat. She shook her head and blinked, trying to force down the pain so that she could focus on freeing herself. Startled by her scream, a murder of crows had left their roost on the skeletal branches of a tree and taken to the air. They painted the sky in dark strokes, like black paint leaving a brush in a jar of water. With each swoop, they turned the sky darker. More of them joined together in the space above her, cawing hungrily. She tried twisting and pulling her finger over and over again, ignoring the crack of cartilage and bone and the seething pain. There was no light in the sky now. It had been replaced by one great undulating mass of black. 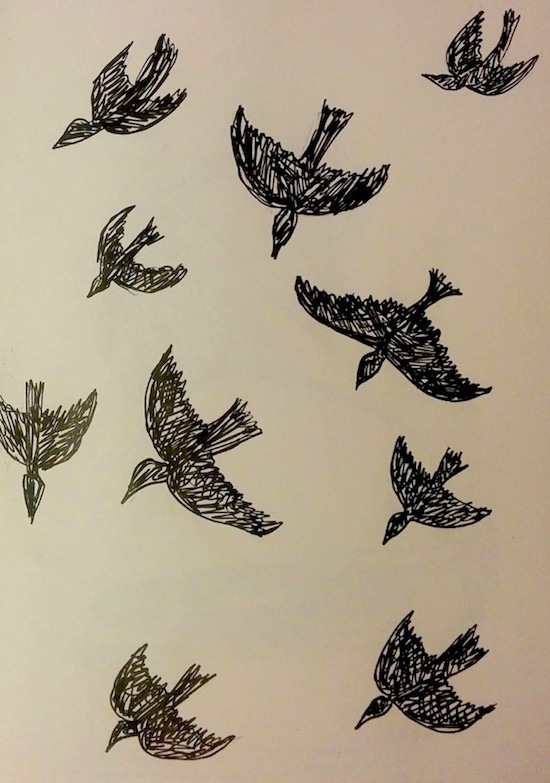 She could feel the displaced air on her face with each collective beat of their wings. It was not long before the first crow broke free from the pack and swooped down, landing on the stone directly in front of her. It turned its head slowly towards her and with one black eye seemed to study her eyeball, its pupil dilating as it traced the swirls of her iris. She thought she saw some admiration in the cold obsidian orb of an eye, the look of someone contemplating a little piece of beauty and wanting inexplicably to destroy it. Isabel missed the sea. She even missed the seaside. She missed the murderous screech of baby gulls down the chimney stack at first light, the way the sea mist made her hair frizzy and the sea breeze made it wild, she missed the silent exfoliation from the sand in between her buttocks, the way the chip fat clung to her clothes, the smell of two pence pieces on her fingertips, the clumsy way the drunken teenagers groped around the beach bonfires, the bass drum rumble in the foot of the cliffs, the drunks in the bandstand, the runners and their lycra-lined creases, the crying children, the potty mouthed pensioners, the cartoon postcards of buxom women falling out of swimming costumes as stick-thin men ogled them, the fortune teller on the pier, the cockles in white polystyrene pots, the bucket and spades for £1.99, the orange net bag of shells for a pound more, the sound of waves lapping at the shore, the bobbing lights of the fishermen out at sea and the distant blinking of the lighthouse. She missed it all. It was a strange feeling to miss so many things, so completely but Isabel did. Sat at her desk looking out on man-made towers that touched clouds and neon lights that melted below, she longed for the sea. Want to see and read more: part one, part two, part three.